The iOptron 7100-HC ZEQ25 with Polar Scope is suitable for all beginners to intermediate-level astronomers, who are passionate about astronomy and astrophotography. Mount, locate, view and take photos…this is the algorithm that best describes this capable and powerful system. 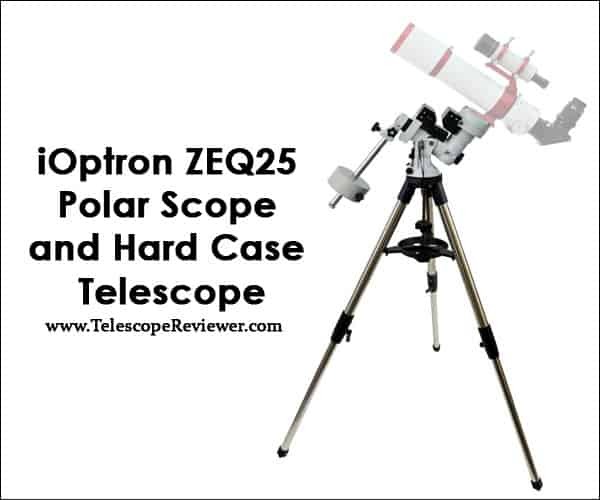 iOptron 7100-HC ZEQ25 with Polar Scope and Hard Case is one of the best intermediate-level telescopes on the market if you are looking for a sturdy balance telescope mount. Its EQ mount is one of the best products currently available on the market, suitable for all astronomy enthusiasts who are looking for a light-weight but resistant mount, specially designed for spatial photography. Having an equatorial mount, your celestial photos or videos will not be affected by the shakiness that we all know and hate so much in other telescopes. The iOptron brand is one of the best telescope manufacturers on the market, and the iOptron 7100-HC ZEQ25 with Polar Scope and Hard Case is one of the best choices for the beginner-to-intermediate astronomer who are serious about this hobby. 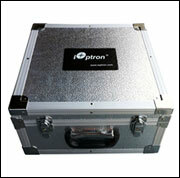 What is the iOptron 7100-HC ZEQ25 with Polar Scope and Hard Case? iOptron 7100-HC ZEQ25 is the brand new Z design mount released on the marked by iOptron. This brand new mount comes with substantially less weight than other models available on the market. Having less weight, this mount will have substantially more stability and it will be easier to carry to the observation point. When describing this model, we need to talk firstly about the Z Balanced EQ and then try to understand the capacities and the benefits of the Hand Controller. The brand new Z Balanced EQ comes with an amazing stable stainless steel adjustable tripod that will keep your mount and the telescope in position during your observation. Besides that, the mount has a built-in GPS, which will facilitate a quick and precise observation. Due to this GPS, you won’t have to introduce data such as the date, the time and the location, every single time you want to explore, so you will save an incredible amount of time. Among the features of this system, you will find an adjustable counterweight bar, which will not obstruct in any way the tripod. The system comes with a sturdy dual-axis servomotor that can be controlled with the hand controller, by simply writing the name of the desired celestial body in the controller’s contextual menu. This means the iOptron 7100-HC ZEQ25 with Polar Scope will be more reliable and stable than any scope you’ve used so far. The ZEQ25 mount comes with the Gotonova Goto technology. This accurate Goto mount has a database with more than 59, 000 celestial objects than be accessed with the help of the remote control included in the pack. Setting a scope and then locating celestial objects has never been so easy. 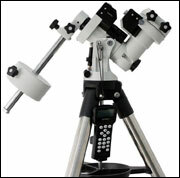 The ZEQ25 is suitable for all beginners to intermediate-level astronomers, who are passionate about astronomy and astrophotography. Mount, locate, view and take photos…this is the algorithm that best describes this capable and powerful system. Built-in GPS – this feature saves time and money. 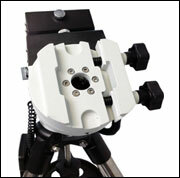 In the case of other mounts or even for some computerized telescope, you will have to purchase a separate GPS accessory, but for this product, everything is already included. The tripod – a stainless steel sturdy tripod, this piece is one of the best tripods available on the market. It just gives an incredible stability on both flat and uneven terrain. GO2NOVA 8408 Hand Controller – this hand-controller comes with an innovative astronomical software that makes stargazing an amazing experience. With more than 59.000 celestial objects comprised in its database, this tool is a great asset for both beginner and intermediate-level astronomers. 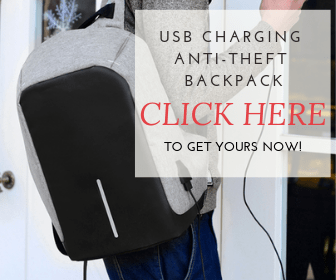 Carrying case – the case makes this mount more than portable. Mounting all the pieces of this EQ mount is relatively simple, so you will want to keep them as much as possible in the case to prevent any type of problems that may ruin the pieces. Electronics – it seems that the electronics of this piece is quite fragile, so you have to take great care of it. Where to find the iOptron 7100-HC ZEQ25 with Polar Scope and Hard Case? The iOptron 7100-HC ZEQ25 with Polar Scope and Hard Case can be found on Amazon with a price that varies around $800 – $850, with free shipping included. Usually, Amazon comes with a lot of reduction, so you may want to keep an eye on their offers. There’s also the option of buying a second-hand mount, but you will take a lot of risks. This mount is somehow a fragile piece, so it may be a good idea to purchase a brand new one. iOptron 7100-HC ZEQ25 with Polar Scope and Hard Case needs little to none maintenance work. If you want to keep your piece working for more time, try not to overload the mount and not to drop it. If cleaning the mount is imperative, use a clean soft lint-free piece of cloth and remove all the debris from the mount. Do not use any type of solvent, as this may damage the components. Try not to use the mount for an extended period. When you finish using it, dismount the OTAs and the counterweight. Then place the piece in the carrying case. When you receive the mount, the number of accessories impresses even the pickiest astronomer. 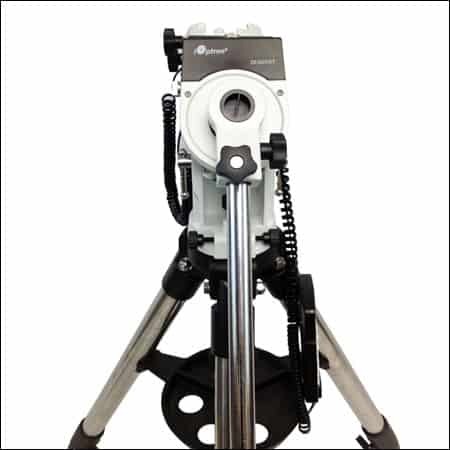 First of all, you will have the stainless steel tripod that sustains the iOptron ZEQ25 Computer-Controlled EQ Mount, and an AC Adapter that allows you to connect the telescope to a power source. Secondly, the counterweight, which will allow you to balance the scope and to maintain the right position during observation, comes as a separate accessory. Thirdly, you will have the GO2NOVA 8408 Hand Controller, with its cable. The software installed on this device has a database with more than 59.000 celestial objects, including stars, planets, constellations and even comets, making the telescope’s alignment a piece of cake. All these accessories, as well as the actual mount, fit perfectly in the aluminum carrying case that facilitates the transport of the pieces. The mount comes with a 2 years warranty. If or when the product ceases to work, it is highly recommended not to try to repair it by yourself. Any reparations or changes to the original design of the iOptron 7100-HC ZEQ25 with Polar Scope and Hard Case will automatically lead to the loss of the warranty. The mount’s warranty won’t cover a product that has been modified, abused, mishandled or had unauthorized repairs, so you may want to check these aspects before sending the piece back to the producer. iOptron 7100-HC ZEQ25 with Polar Scope and Hard Case is a remarkably good EQ mount. For all the accessories attached on this mount, the price is absolutely great. If you are looking for a stable, vibration free mount, then this system is more than suitable for you. The mounting is extremely easy to do, and you can literally set the whole thing up in less than 20 minutes; the GPS also helps gaining time and if you also want to take some shots of the celestial bodies, this is one of the best systems, so we strongly recommend it.